I have two tasty things to share today. 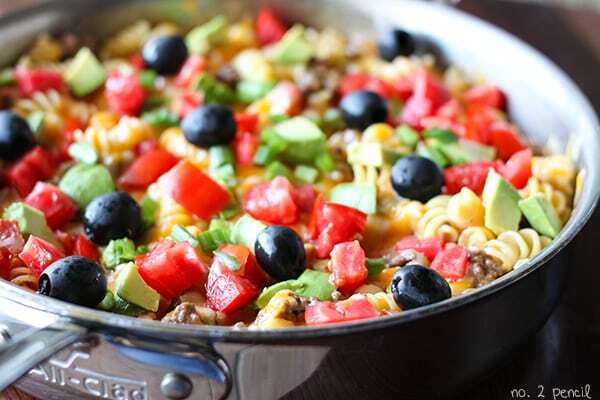 The first is my latest one-pan recipe, One-Pan Taco Casserole. 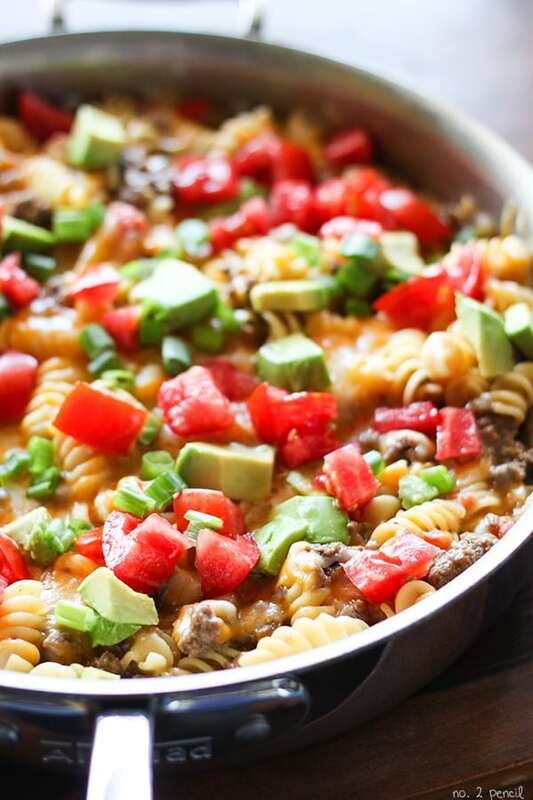 It’s a variation of my popular one-pot cheeseburger casserole. One-pot meals are a favorite in our house, and this one is definitely a keeper. 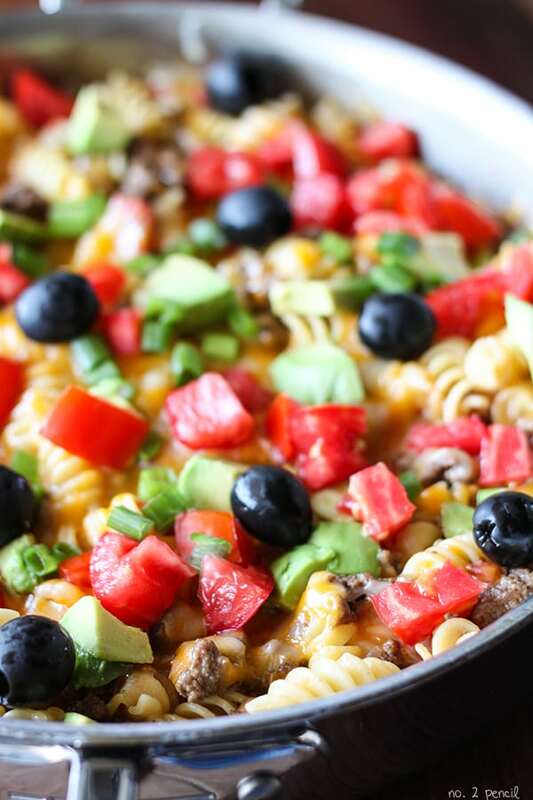 The pasta and ground beef is simmered in a flavorful broth seasoned with tomatoes, chili powder and cumin, and topped with melty cheese, fresh tomatoes and avocados. I added green onion and black olives for even more flavor and variety, but really anything goes. I especially recommend trying the avocado – the rich and creamy avocado is surprisingly delicious paired with the pasta! I’m also a fan of sour cream on my tacos, so I mixed two heaping tablespoons into the pasta for a delicious creamy sauce. I’m also sharing on of my new favorite sources of inspiration, Yahoo Food. Yahoo Food in an online food magazine that is brimming with delicious recipes and fun articles about food. 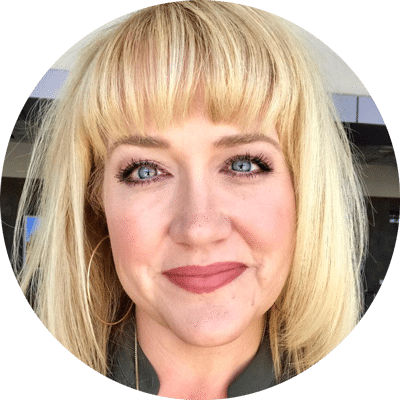 So in addition to getting fresh new recipes, you can see articles about food news, how-tos and food science (one of my favorites!). Plus they have gifs, and I cannot get enough food gifs in my life. Thanks for all the inspiration, Yahoo Food! I can’t wait to see more! 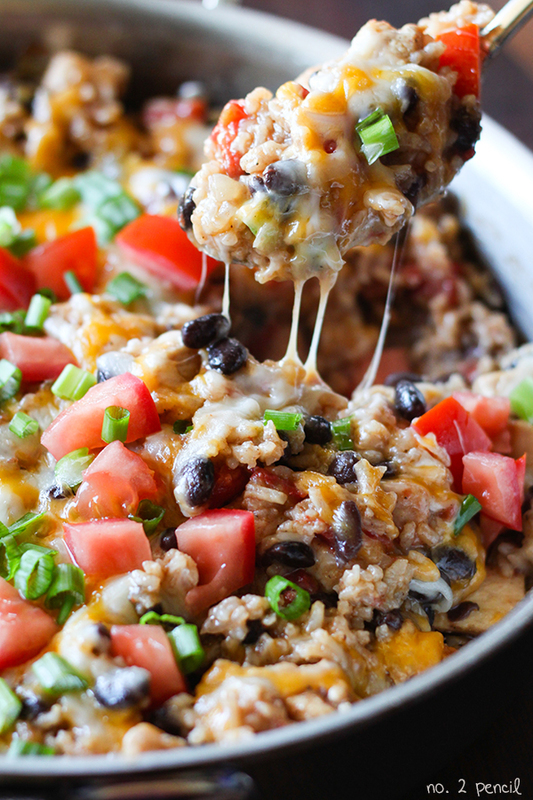 Let me show you how easy this One-Pan Taco Casserole is to make. Start by sautéing the onions in a bit of olive oil. Then, add the ground beef and season with salt and pepper while cooking. I used lean ground beef in this recipe, and as you can see from the picture, there is not a lot of fat left behind. If you have excess fat or if the meat has been frozen and released a lot of liquid during cooking, you may need to drain the meat mixture before the next step. 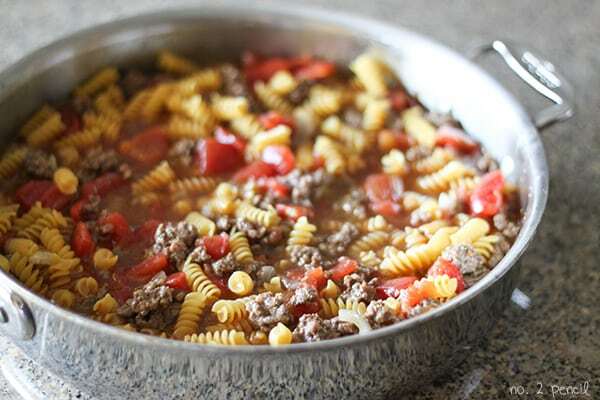 Once the ground beef is cooked through, add chicken broth, canned diced tomatoes, tomato sauce, pasta and seasonings to the pot. Bring to a simmer, cover and reduce heat to low. At this point, your pasta will probably look a little saucier than pictured. After I made and photographed this recipe, I wanted to bump up the flavor. So the next time I made it, I added a small can of tomato sauce and doubled the spices. Perfection! Once the pasta is tender, stir in two heaping tablespoons of sour cream. This step is optional, but delicious! Then stir in one cup of cheese, and top with the additional cheese. Once the cheese has melted, top with your favorite taco fixings. Fresh tomatoes and avocados are especially tasty! If you are looking for more one-pot dinners, all my one-pot recipes can be found here. Saute onions in olive oil over medium heat, just until softened. 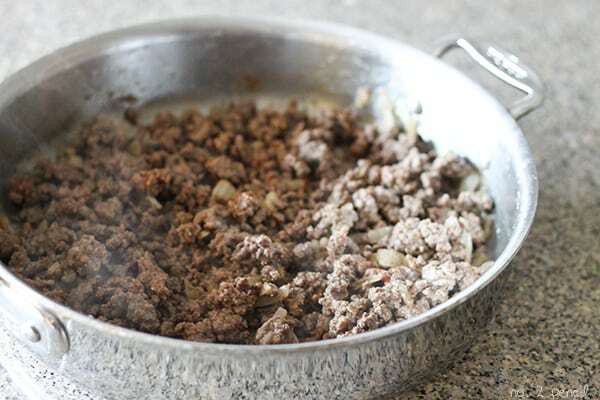 Add ground beef to pan an brown, breaking up meat as it cooks. Season ground beef with one teaspoon of salt and black pepper, to taste. Once beef is cooked, add tomatoes (undrained), tomato sauce, chicken broth, dried pasta, seasonings and additional 1/2 teaspoon of salt. Cook 12-15 minutes, or until pasta is tender. In the meantime, prepare toppings by shredding cheese, dicing tomatoes, green onions and avocados. Once pasta is tender, remove from heat and stir in two heaping tablespoons of sour cream and one cup of cheese. Top with additional cheese and replace lid to let cheese melt. I used chopped tomatoes, diced avocados, green onions, hot sauce and black olives. 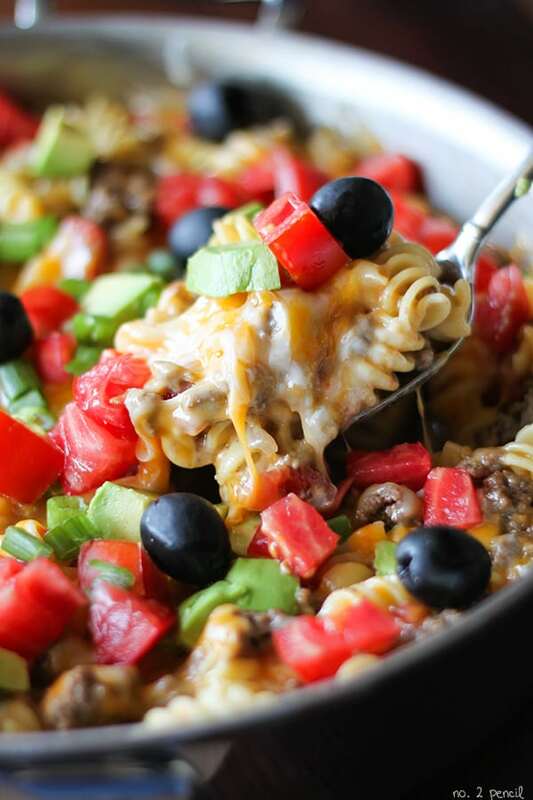 Taco casserole? Sounds absolutely delicious. Amazing article and recipe, Melissa. After trying another of your recipes, we made this one today. I used fiesta diced tomatoes and taco seasoned ground turkey, so I could have probably cut the spices in half, but my family likes alot of flavor so it was a hit! This is our second time making this meal, and we all love it! I added a can of black beans, because we love beans, but besides that just made it how it is written! It is delicious, and perfectly flavored! We’ve made a few I’d you’re one-pan meals, and all of them have been delicious! Thank you!